Why Does My Normally Sweet Cat Attack Me? There’s nothing more relaxing than sitting on the sofa with a purring cat on your lap. The soft fur, the snuggling little animal, and that purr melt your heart. Suddenly, the snuggling little heap of fur hisses scratches your hand and yowls at you. You’re confused. What happened? What did you do to turn your sweet cat into a raging cat? The good news is it isn’t you. Aggression in cats isn’t normal, but it happens. It has many causes. First, though, did you miss something? What does aggression look like? What Does The Face Of Cat Aggression Look Like? What Is The Body Posture Of An Aggressive Cat? The aggressive cat going on the offense is a totally different animal from a defensive aggressive cat. The body posture is more what you’d see on the Wild Kingdom or the Discovery Channel. Of all animals that have wild animal wrapped around their DNA, cats are it. If it’s only a foot or a hand unconsciously handy, the aggressive body posture can be mistaken for a playful one. The animal will stealthily gather his body into position for a powerful leap, silently twitch his tail, and pounce. Cats don’t even have to be taught much by their mothers as newborns, maybe just the basics. What Is The Body Posture Of The Defensive Aggressive Cat? What attracts humans to cats aren’t the same that attract predators to cats. Cats are small, which makes them vulnerable to anything that threatens them. All animals will fight to protect their territory, their young, and their food supply. When an indoor cat shows signs of aggression, there’s always something behind it. Animal behaviorists classify them as social, medical, redirected, and other types of aggressiveness. 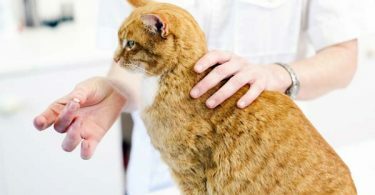 Other medical problems include arthritis, dental problems and abscesses, trauma, and the cognitive and sensory problems associated with senior cats. Have your vet thoroughly go over your cat to make sure his aggression doesn’t stem from medical problems. It isn’t a medical problem, but a cat with long hair will sometimes have dags and knots in his fur. These might prove painful to the animal when the pet parents stroke the cat. The cat’s ears might need to be cleaned and checked for mites or other pesky things. These are simple things, but they could be hurting your cat. Cats don’t “own” the pain as humans do, but they do associate some things with the pain. These associations will cause aggression in fear of exacerbating the pain. For example, a cat with an ear infection will become aggressive because he associates the petting and rubbing with the pain. Additionally, cats don’t understand that the pain originates inside their bodies. Your cat knows he has pain when he goes to the litter box. He will begin to urinate on the floor in the hope of making the pain go away. You’ll know to get him to the vet when this happens. We mentioned above that cats are not so far removed from their wild brethren. Cats hide their illnesses. In the wild, this protects them from becoming supper for someone considering them too weak to fight off. Even if they only have a pet parent, it’s the same instinct for house cats. While a house cat will get around vulnerability, he won’t show any pain or unease. They just flick their whiskers, twitch their tails, and get on with it. Only when they become so sick it’s noticeable to pet parents, or when they become unexplainably aggressive, will anyone know how sick they really are. Cats are no different from any other animal in establishing dominance over other cats. You see it in tom cats duking it out over a particularly nice trash can or a female. You generally see this type of behavior in cats that haven’t been neutered. Their body postures will be stiff, with the hair raised up on their arched backs and tails. Their tails will stick straight up in the air. Their ears will be laid back, teeth bared, and they will yowl, hiss, and spit. One tom might slowly back out of the fight, or the two could go at each other until one emerges the undisputed king of the area. Dominance between house cats is a little different. Their body postures will be quieter. One will stand straight and tall, with tail straight up in the air. The fur will be fluffed from nose to the tip of his tail. He will stare threateningly with a meow that means business. The other cat will curl into a ball, trying to make himself look small. His tail will be curled around his body, his head tucked in. His ears will be laid back, his fur also fluffed in alarm. They will quietly spit or hiss at each other and smack at each other, all done quietly and under the radar of the pet parents. The aggression doesn’t have to be confined to male on male aggression. It happens between male and female as well as two females. It happens mostly due to size; the larger animal will pick on the smaller cat. However, it can also occur when one of the cats has a bad reaction to thunderstorms or fireworks. Then, too, they might just not like each other. Other cats and even dogs aren’t all that can threaten a cat. He must prove his dominance over new people in the house, too. Suppose you had a new roommate move in. Perhaps your senior parents have come to stay. You could have had a new baby and brought her home. The cat’s security is threatened. He must dominate the situation or be vulnerable, something no cat will allow. The cat will block doors, swat at the legs of anyone attempting to pass, swat other animals or another cat, and hiss. His ears will be laid back, tail swishing dangerously, and his fur will be fluffed. Any mother, animal or human, will fight to the death to protect her children. Cats (mother cats are called queens) usually become aggressive toward other cats as well as dogs, but people come in for some hissing, too. The best thing is to avoid touching or even getting near the babies until they’re at least four weeks old. It isn’t unknown for male cats to eat kittens, so a queen’s aggression is understandable. Keep in mind that a queen’s hormones are still raging through her body, so her “touch my babies and you’re toast” instinct will be strong for several weeks. She will also defend the immediate area around the kittens so that they have room to move around safely. Helping her with a baby gate to protect the area and discourage intruders will alleviate her aggression. Humans get rough when they play, so why can’t cats? With kittens and yearlings, they chew on each other, swat, and wrestle with each other. Part of it is predatory (another cat-must destroy!) and part play. Through this play, kittens learn to pull their punches, so to speak. The claws don’t come out, the teeth aren’t bared, and the swatting doesn’t hurt. When a kitten is taken from its litter mates too early, he doesn’t learn this caution. If he doesn’t interact with other cats or even dogs, his play with his pet parents will hurt them. He thinks he’s just playing, though, and never learns to take it easy on Mom and Dad. Other causes of play aggression are when pet parents rough-house with the cat, so he thinks that’s the way it’s supposed to be. Additionally, if a cat is alone due to his pet parents working all day, his excitement at seeing someone (anyone) will cause him to play rough. The cat’s body posture during play aggression will be when the body is low-slung, tail twitching menacingly, eyes staring, and clearly about to pounce. The ears will be firmly folded back against the head. He will often pounce from a hidden place such as beneath furniture or behind a wall and swat or wrap his legs around the target. If it’s a human, ankles, and calves are prime targets. This occurs when the cat sees, hears, or smells something to which he can’t react. He will be frightened and agitated in the extreme. He might see another cat outside, a squirrel close to the window, or hears a fire truck siren, thunderstorm, or smells something with an unpleasant association (most likely the vet’s office.) Since he can’t get at what he sees, he holds that aggression inside. Guess who gets it when they come through the door? You. Another house cat or the dog could end up being attacked. This is the most dangerous type of cat aggression. 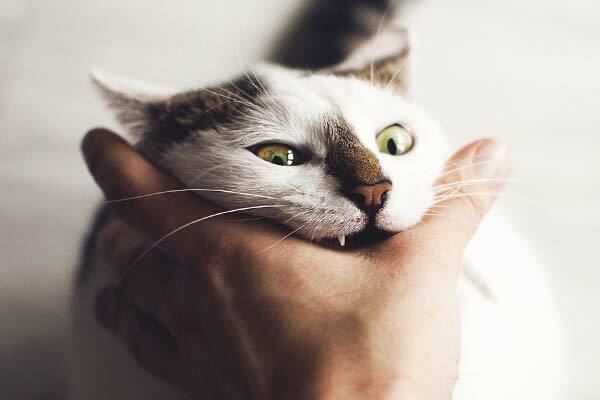 Pent-up emotion or aggression manifests in deep scratches, painful bites, and screaming. These can become infected and cause pain for pet parents. Cat scratch fever isn’t dangerous, but it is painful and needs to be treated immediately. The weird thing about this type of aggression is that the cat can go for hours without twitching one whisker. All of a sudden, out of left field, comes this hissing, scratching, biting, yowling tornado. Pet parents are rightfully confused, and now they’re physically hurt. Any of a dozen things will cause a cat to be afraid. They’re small, so many bigger things can make a cat afraid such as strangers, loud or violent people, threatening dogs, boisterous children, or perhaps loud noises like backfiring cars or thunder. Fear-based aggression encompasses physical, psychological, and emotional. The instinct is the same as in a human: fight or flight or just freeze in place. This most universal of all instincts is the same in cats as in humans. Cats just take it one step further: if I can’t make this thing go away, then I’ll just attack. A fearful cat will first try to run away or hide from the thing causing the fear. If that doesn’t do the trick, he’ll try something that might work. During all this, he might pace, pant, his heart rate will increase, and he might lose control of his bowels on the spot. His body posture will change drastically. A cat who is afraid or who senses a threat will take an aggressive stance if the fear or threat grows and he can’t get away from it. Fear will make the cat curl up into a ball, tail tucked, ears flat against the head, eyes dilated, and body trying to roll away from the threat. If the cat can’t escape the threat, he will hiss, spit, howl, bite, and scratch. The fur will be standing up, tail fluffed. It happens to all pet parents. One second you’re snuggling with your fur baby, and the next he’s acting like that tornado we discussed above. Cats tend to have an internal timer attached to petting. When the timer goes off and the pet parent is still stroking the cat, then the cat reacts. Badly. Sometimes, though, over-stimulation isn’t the cause of the cat’s aggressive behavior. Pet parents love to pet or stroke the whole animal. If a certain body part or area is sensitive, this could mean pain to the animal, even if the stroking is gentle. Ears and tummies tend to be tender spots on a cat. So when the time is up, stop petting the animal before tragedy strikes. Bad memory will also cause a cat to be aggressive. Perhaps a bad experience with the vet or maybe with his last pet parents make certain spots on the body a bad place to pet. Small children are rough with animals because they don’t know any better. Tails and ears tend to be sensitive spots on a cat’s body due to children pulling on them. Learn these places and stay away from them. In this instance, the cat’s body posture will be much the same. First, you’ll notice the eyes becoming wide with the pupils large and black. Then the ears will go flat against the head. The tail will twitch menacingly, and the soft hiss will sound. For your own sake, stop what you’re doing before you start to bleed! Let’s say one of your two cats takes a trip to the vet or the grooming spa at the pet store. He comes back home smelling and looking terrific. Your other cat may see a recognizable cat, but the smell and the aura of the other cat is alien to him. They may have been raised together from kitten-hood, but this thing coming through the door is a “new” cat. Cats will try to destroy something “new” that might be a threat. A neutered or spayed animal is often docile and good-natured. Intact cats, though, tend to be aggressive, territorial, and over-protective. They will spray to mark their territory and jealously guard their young and their “pets,” or pet parents. By now, you’ll recognize the body posture. The back will be arched, tail straight up in the air, fur slightly raised, pacing, hissing, and swatting if another animal or person gets too close to “their” territory. A bored cat will search for something more fun to do than playing with his kitty toys. He’ll knock things off counters and tables, shred the paper towels or the toilet paper, and pick threads out of the furniture or carpet when he sharpens his claws. He’ll climb up the drapes and shed on anything white. Make that anything. Then someone comes through the door. This could be a brain-sucking amoeba from outer space. This could be a furry, one-eyed monster with an affinity for cat food. So he will crouch, tail swishing, ears pinned back, and body pounce-ready. You, unfortunately, are the alien cat-food stealing, ba rain-sucking threat that must be destroyed. That’s gonna hurt. Introducing a new cat into a home in which a resident cat reigns supreme is not easy. After the first sniff to check him out, the original cat could be put off by the introduction. If he takes a dislike to the new cat, then he will display aggressive behavior. The body posture will be the same as in all other types of aggressive behavior. It will simply take time for the two to come to some sort of amicable truce. It’s time for your vacation, and you decided to travel and see where the highway takes you. There’s no one to come in and feed the cat, empty his litter box, or play with him. No problem, he’ll just come with you on vacation. This could be perceived as a threat to the cat. The travel trailer is different, the smells and sights are different, and even the cat food is different. Maybe you’re having a remodel done on your house. You’re staying with your parents until the reno is done. Your parents have a large and, although docile, still strange dog. The cat feels threatened and hides beneath the bed for the duration of the remodel. You might be moving into a new house. The kids are going to college, so you need less room. Perhaps your parents need looking after, so you’ll need space for them. You might be having a child and need more room. Whatever the circumstance, a new house will smell and feel strange to the cat until he gets used to it. What a cat perceives as a threat in these scenarios is a situation he can’t change. He fears it. Because these things will take a long time, his world can’t return to his definition of normal. He isn’t acting out, he’s uneasy and possibly fearful of these new surroundings. Since the cat can’t talk, he can’t tell you the horrors of being homeless, of having his former pet parents taken away from him, or the insecurity of fending for himself. You may look like nice pet parents, but his last pet family did, too. How’s a poor cat supposed to know? In this situation, too, the physical, psychological, and emotional is involved. He’s afraid no one will ever love him again. He’s afraid he’ll be hungry. He’s afraid he’ll never be warm and dry again. These feelings and fears, just like in humans, can and do cause physical illnesses, not to mention mental ones. This type of aggression will possibly take not just a vet to remedy, but an animal psychologist. Although a house cat may have “wild animal” DNA in his blood, the truly outdoor cat really is wild. These animals are feral and magnificent hunters. The hunting instinct, as well as the fight or flight instinct, is stronger in the outside cat. He can’t imagine eating from a bowl or “going” in a box. Nor can he quite see his way to letting a strange human pet him. Trying to adopt a wild or outdoor cat isn’t the best of ideas. The aggression is a way of life for him. Some animals can be bred to a family member, and good lines will emerge from the mating. Sheep and horses can be bred to a father or a mother, and the bloodline will remain strong. When breeding other animals to a family member, mental and health conditions could result. Do it too much, and the baby animal could be mean as a snake. In cases like a cat being bred to her father or brother, this kind of thing could very well happen. This kind of aggression can’t be eliminated by any amount of time with a pet psychologist. As much as you love cats, give this one a miss for your own health. 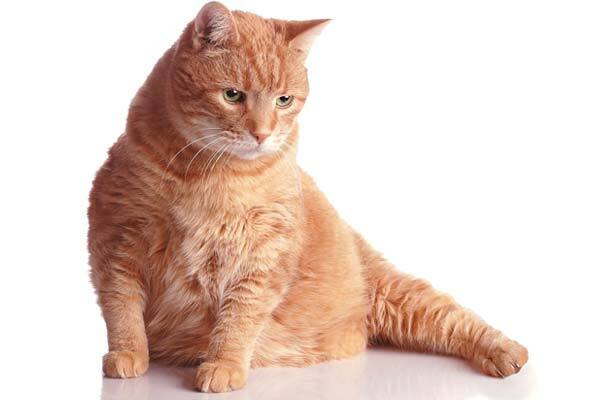 Most cats are finicky eaters, but there is one type of cat aggression that has to do with food. Any food. This type of cat will meow endlessly until his food bowl is full. He will eat other animals’ food, your food, and chew through bags to get at food (think Garfield.) He will hunch protectively over his food bowl as he eats, growling at anything that gets near it. He will attack anything that interferes with his culinary pleasure. This kind of body posture is entirely different. The cat will hover over his food bowl, tail tucked, ears flat against the head, and hissing up a storm, even if no one is near. This type of cat aggression is as primal as the mother protecting her kittens. No, this isn’t a Springsteen thing. This type of aggression, if it can be called that, is inherent in the cat who sees his home as his fiefdom with himself as undisputed king. This cat gets the best chair in a sunshiny window. Everyone steps around him as he lies in his favorite sunbeam on the carpet. Never mind that it’s in a high traffic area. If you don’t feed this type of cat right on the dot, he’ll get pushy. He’ll plop himself in your lap when he wants his belly rubbed. It doesn’t matter that you’re in the middle of a conference call for work. If he wants to play with the socks you’ve laid out for your afternoon run, then too bad for you. It isn’t really aggression, but it can rapidly escalate into it if this type of cat is denied his rights as king. He might not bite or scratch, but trust us, you’ll know he is displeased by the laid back ears and the royal hiss. As basic as the fight or flight instinct, the instinct to mate is just as important to the neutered cat as it is to the intact cat. He will become sexually aggressive mostly with his blanket, cat bed, or a soft kitty toy. His pet parents pillows, dirty laundry, and blankets may become attractive to him. Unfortunately, he tends to have this aggressive behavior in front of people, which is a little embarrassing. The body posture in this type of aggression is familiar to everyone. The first step in dealing with an aggressive cat is recognizing the triggers that make him aggressive. We’ve given you several reasons for such behavior. Recognition is the first step toward helping your cat become sweet and loving again. Watch the cat’s body language. When you see him “assume the position,” look around. Is there a cat parading across the yard and your cat saw it? Is there a new animal in the house? Is there a new baby, room mate, or other human in the house? If you live near an airport with planes screaming in all day, or if you live near a fire house with an active siren, we can’t do much to help you. If it’s possible, change the situation so your cat becomes calm. Don’t touch or comfort the cat until he is calm again. If you do, it sends the message to the cat that such behavior is okay. Reintroducing cats that have been separated for a time such as vet visits takes time. A pet behaviorist might need to work with both cats. 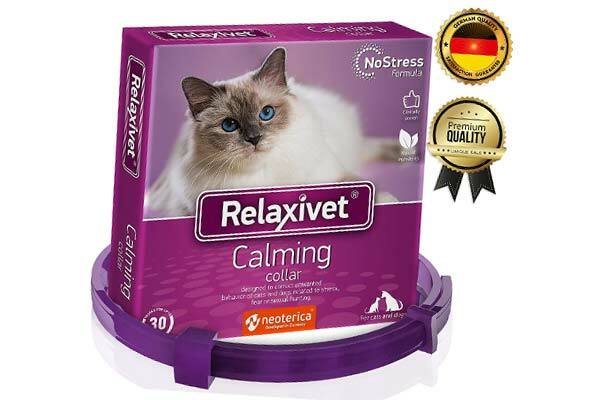 Calming medications and even collars are available to help your cat return to normal. Aggression in cats is not normal. It stems from health or from outside sources. It is an emotional and physical reaction to such stimulation. Since stimulation is a constant in life, aggression will come and go as long as a cat is around. The cat will even give you hints that aggressive reactions or behaviors are coming. This is often involuntary, as we’re pretty sure a cat can’t control when his fur fluffs up when he’s alarmed. The wide eyes, the ears laid back, and the tail curling around the body are all signals that bad time is ahead. There are dozens of reasons a cat will become alarmed or threatened. How his pet parents handle the situation is very important. Recognize what sets him off. Wait until the aggression subsides. Don’t rough-house in play with the cat. Good luck! Save my Stuff! How Can I Stop My Cat From Spraying?